We were disappointed to have to (temporarily) leave Kalimantan when the smoke from this year’s dry season fires became intolerable. But it did mean that, while living as ‘environmental refugees’ in Java, we had the opportunity to visit the Cipanas site of my host organisation, the Yayasan Usaha Mulia (or ‘YUM’ – The Foundation for Noble Work). Cipanas is located up in the hills, 87km to the southeast of Jakarta, between the cities of Bogor and Bandung. At an elevation of just over 1000 metres, the air is fresh and clear, and it gave us wonderful respite from the thick smoke haze of Palangkaraya. There’s fertile volcanic soil, good water supply, and it’s a perfect place for agriculture. Around the YUM site there are terraced rice fields, market gardens and flower nurseries, and on the higher slopes (up near the 1440 metre pass at Puncak) there are tea plantations. It’s a very attractive landscape. The Dutch had health resorts there, and the Governors (and later President Sukarno) were frequent visitors. 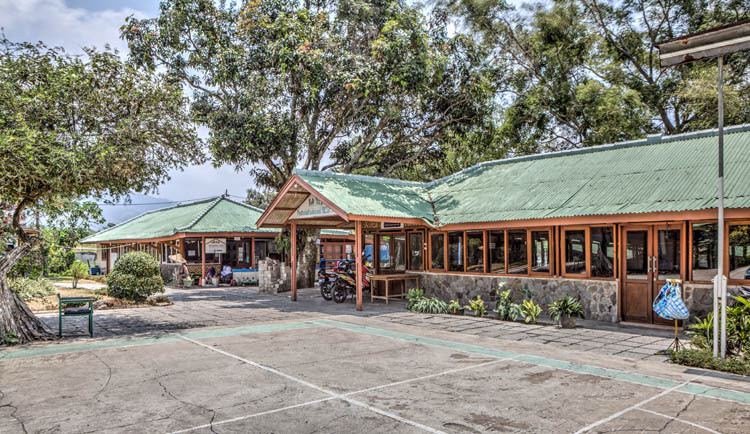 The YUM Cipanas Village was originally (1976) built and operated as a tuberculosis sanatorium, then as an orphanage, but it now functions as a very active community centre. It offers a range of services to low-income families from around the region, in the areas of health, education and community development. The veggie gardens, covering an area of a couple hectares, are sensational. The gardening practices are 100% organic, with companion planting, seed-saving of non-hybrid plant varieties, and no use of chemical fertilisers or pesticides. But the plants are luxuriantly healthy, with no pests! 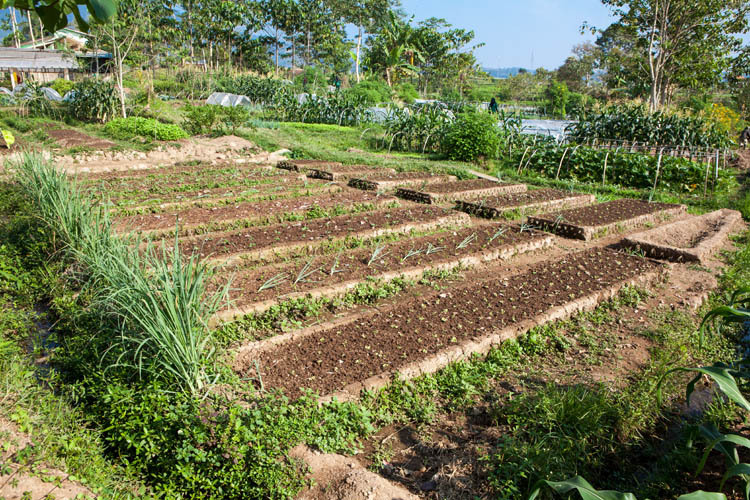 The soil, which was already rich, volcanic and alluvial, has been further improved through the application of lots of compost and animal manure, the use of ‘effective microorganisms’, and careful crop rotation practices. The results are pretty impressive. 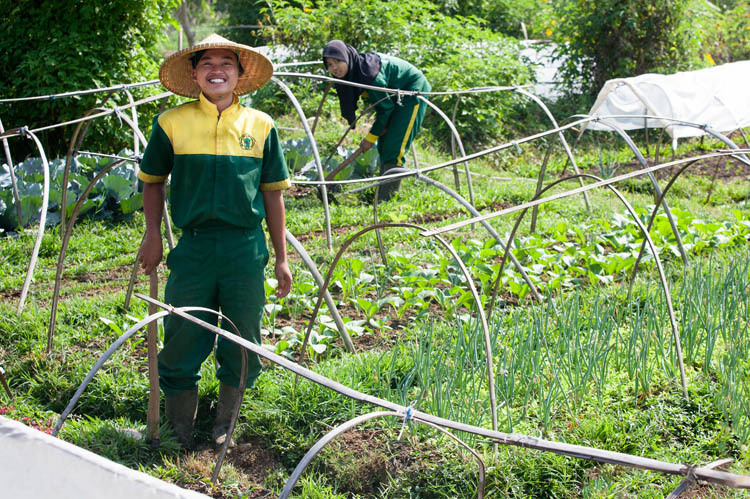 Produce from the gardens is sold locally, and to a number of regular customers (individuals and restaurants) in Jakarta, who get their orders delivered twice a week. Income from these sales helps to make YUM’s charitable activities more sustainable, and reduces, to some extent, their reliance on external donors. 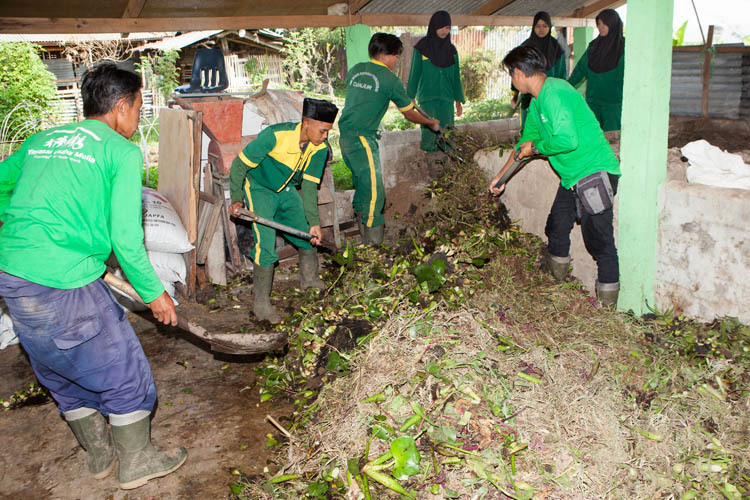 Before sorting, packing and dispatching by van to Jakarta, the freshly harvested vegetables are trimmed, washed twice, and examined for any imperfections. The discarded outer leaves etc get thrown into the fishponds, where the ikan nila (Nile Perch) hungrily devour them. But the organic farm is not just a commercial operation; it is also a major teaching institution, with a busy program of workshops to teach organic gardening principles and techniques. A very successful ‘edu-tourism’ program sees groups of students from Jakarta and overseas schools come for multi-day residential learning experiences. 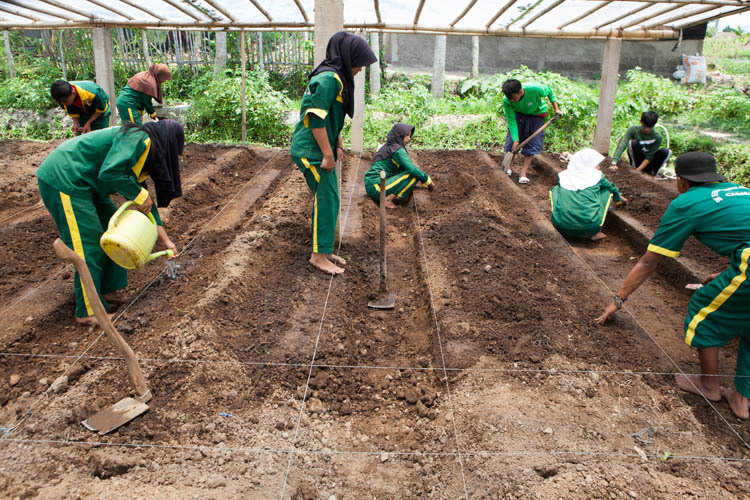 And, locally, students from the nearby agricultural high school (SMK Negeri Pertanian Pembangunan Cianjur) undertake a three month internship program, and seem to be really enthusiastic and diligent about their studies. In the photo above, the students are constructing new garden beds. The end result was a model of precision, with the wet clayey loam moulded by hand to form crisp laser-sharp edges on each bed. The students work happily and energetically – in spite of the heat. Like many people in this climate they start early (7:00am) to avoid the worst of the heat. Overseeing and managing all of the organic gardening activities is Oleh, who I had previously met in Kalimantan when he came over to run a week-long workshop on seed-saving and other plant propagation techniques. 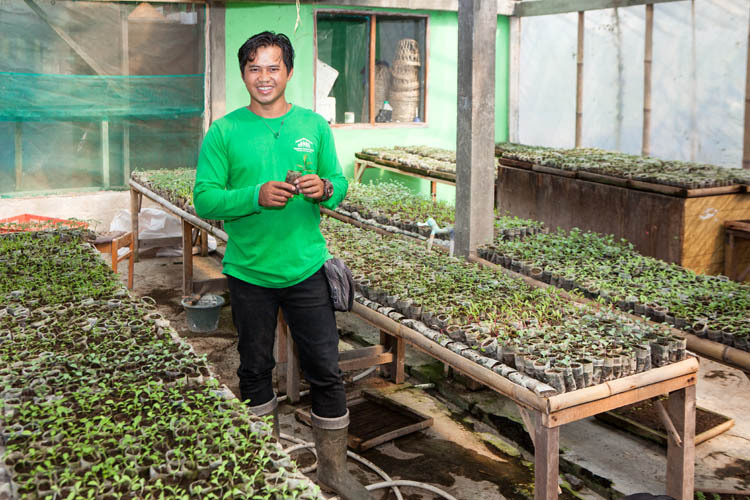 The success of the Cipanas gardens is in no small part due to his knowledge, experience, project and people management skills. And he’s a really nice guy, too. As well as producing a wide variety of the ‘standard’ local vegetables (including lettuce, tomatoes, zucchini, cauliflower, bayam spinach, beans, chilis, spring onions, brown onions, garlic, bok choy, carrots, sweet potatoes, corn… et cetera), a number of herbs are also produced in commercial quantities. 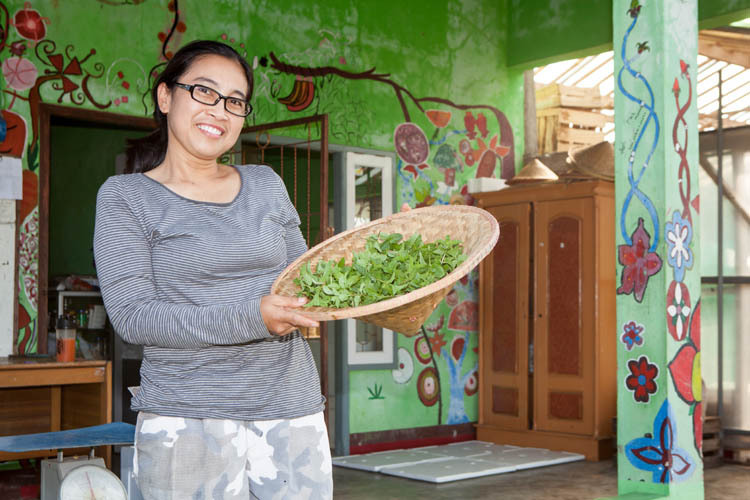 In the photo above, Dian poses with some freshly harvested and rinsed mint leaves. When she’s not being active in the gardens, Dian handles the twice-weekly deliveries of produce to Jakarta – a 14-hour day each time. Plus she runs the dance and music classes. And she found time to look after us and guide us around. We thought there must have been three of her. Big quantities of compost are produced, and fast-tracked by adding home-produced microorganisms in a liquid brew. 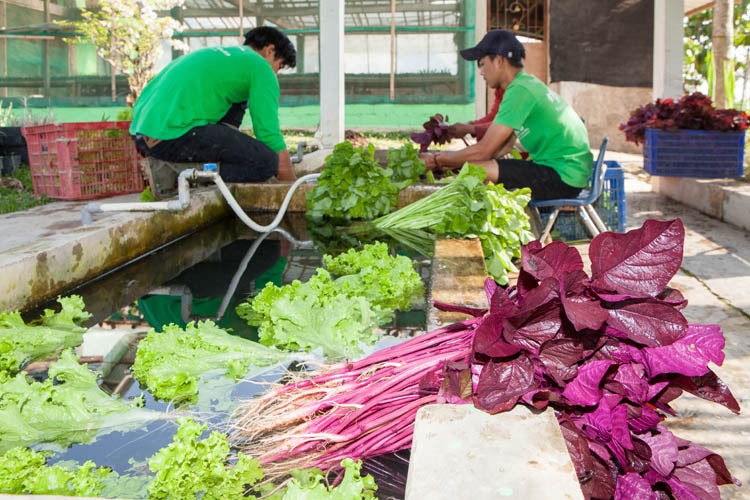 Luckily there’s no shortage of suitable vegetable matter, including from plants grown on top of the fish ponds. As well as horticulture, the farm also undertakes ‘small animal husbandry, chiefly with goats, fish farming and geese. The geese would emit a raucous cacophony whenever we walked past – but they seemed to largely ignore everyone else! Association with YUM has given many young people life-changing opportunities that would otherwise almost certainly have eluded them. This is especially so for those gifted but underprivileged kids who have benefited from the sponsorship and scholarship program. Ita is a very smart (and very personable) young lady. Despite her good grades and enthusiasm, her family simply couldn’t afford to send her on to study at university. But she has just found out that, through YUM, a generous donor has agreed to fund her studies right through to graduation. She’s pretty chuffed! 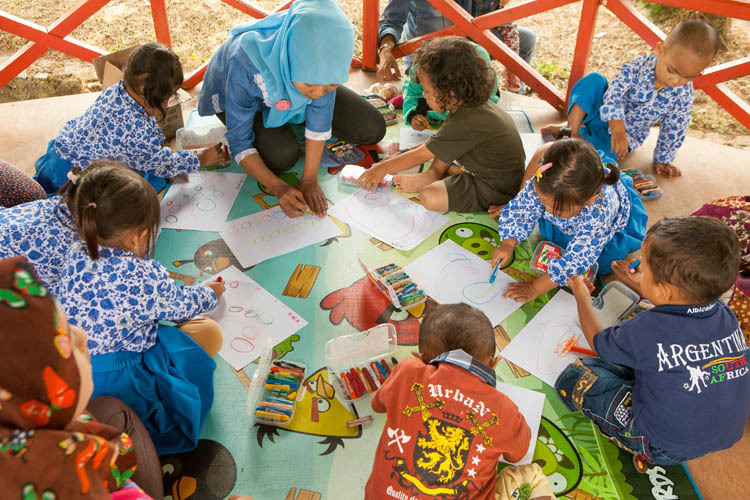 The YUM Cipanas Preschool has recently won awards as the best preschool across the three districts of the region. Teachers Desy and Heti keep the kids engaged and interested, and stop them from drawing on each others’ faces with crayons when necessary! 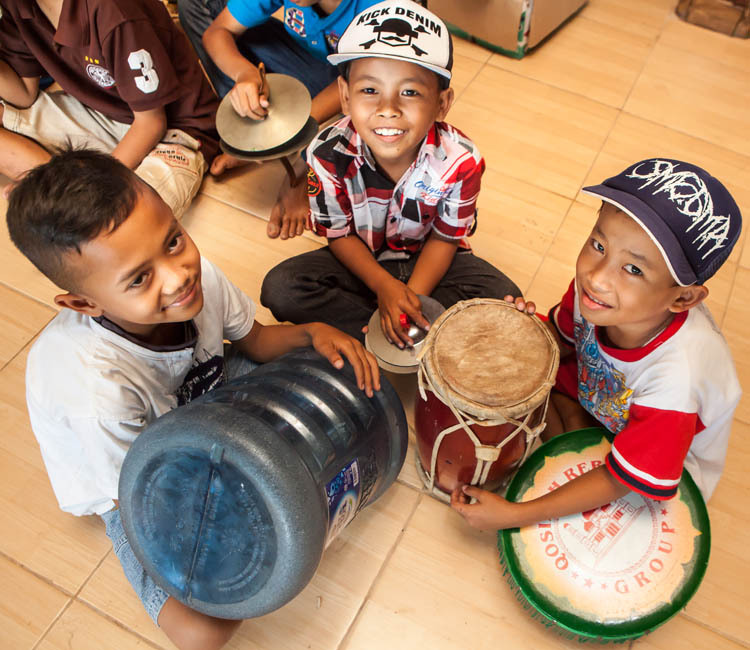 We attended an after-school traditional music class led by Dian (amongst her many other responsibilities!) 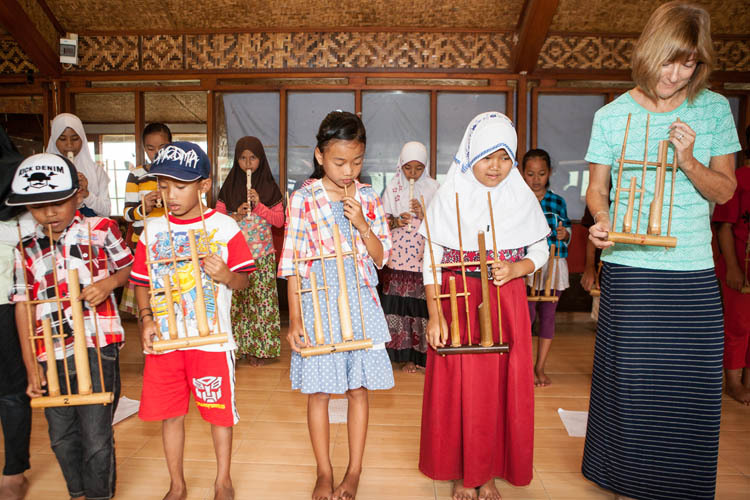 A lucky visitor might be invited to join in playing with the angklung orchestra! Maybe its not entirely traditional, but an empty Aqua water bottle makes an excellent addition to the orchestra’s rhythm section. In the Vocational Training Centre (VTC), the English language classes are well attended, and very popular with senior high school students wanting to supplement their school lessons. We sat in on three classes, with the STRONG encouragement of the teachers who were delighted to have ‘native’ English speakers in attendance (even ones with strange Aussie accents). In the sewing classes, a mixed class of students were learning the basics of dressmaking and tailoring, using “Typical” brand sewing machines. In the crowded computer training room, an all-male class of students were learning how to create and edit tables in MS Word 2010. Where were the girl nerds? Our thanks to all at the YUM HQ in Jakarta and the YUM Cipanas Village for organising our visit, and taking such good care of us during the days we were there. We have nothing but praise for the professionalism and positive attitudes of the staff, and the obvious value of the work that they are doing there. It’s an impressive operation, and they should be very proud! More photos from the YUM Cipanas Village can be viewed on my website. This entry was posted in Indonesia and tagged Cipanas, Organic gardening, Yayasan Usaha Mulia, YUM. Bookmark the permalink.